A superbly-presented, Two Bedroomed, First Floor Apartment with its own front door and own Private rear Garden Area. The property offers good-sized rooms throughout and has neutral re-decoration and modern Kitchen and Bathroom fittings. 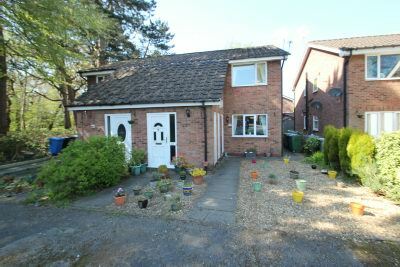 The location is ideal being towards the end of a cul de sac with lovely established Woodland to one side. Entrance Hall having an opaque, UPVC double glazed front door with window to one side. Staircase rises to the First Floor. First Floor Landing having door through to the Lounge. 14'5'' x 9'10'' Lounge. A well-proportioned Reception Room having a UPVC double glazed window to the front elevation. Coved ceiling. Dado rail surround. Door opens to useful storage cupboard. Open Plan into the Dining Room. 9'10'' x 8'10'' Dining Room. Another good-sized room having a glazed folding door to the Kitchen. A further door into the Inner Hallway. Coved ceiling. Dado rail surround. 8'8'' x 6'7'' Kitchen fitted with a range of base and eye-level units with worktops over and inset stainless steel sink unit with mixer tap. Ample space for a range of freestanding appliances. UPVC double glazed window to the side elevation. Wall-mounted, 'Worcester' gas central heating boiler. Inner Hallway having doors providing access to the Two Bedrooms, Bathroom and useful storage cupboard. Loft access point. 11' (max) 8'9'' Bedroom One. A good-sized Bedroom having a UPVC double glazed window to the rear elevation which provides lovely views over the Garden. Built-in wardrobe cupboards to one wall. 8'7'' x 6'3'' + door recess opening Bedroom Two having a UPVC double glazed window to the rear elevation providing views over the Garden. 6'4'' x 5'7'' Bathroom fitted with a modern white suite with chrome fittings comprising of: panelled bath with electric shower over, low-level WC, pedestal wash hand basin. Tiled walls. Opaque, UPVC double glazed window to the side elevation. Inset spotlights to the ceiling. Outside there is Resident Parking. To the rear, there is a lovely, enclosed lawned Garden Area with established borders surrounding.